Kiwi Alphabet Card Set by Tanya Wolfkamp Kiwiana for Kids and Adults Alike. Designed and Made in New Zealand by Wolfkamp & Stone. A i..
What would you do if a dragon swiped your dog? Paddy and Flynn packed their bags in the dead of night and set off before dawn to rescue Co.. Here the boys discover by accident a map, on which all the familiar landmarks appear to have another, secret name. Fascinated by 'The Dragon Hatchery'.. The final book in the hugely popular Dragon Brothers Trilogy culminates in an unplanned and wild ride for Flynn and Paddy, the two young brothers who ..
With augmented reality. Download the 'AR Reads' app and you are all set.Dragon Defenders carries on Paddy and Flynn's story three years after th..
Eve's Sister takes all the hard work out of choosing just the right thing for the 3-7 and 8-16 year old girls. Popular and practical Eve's Sister sleeveless zip-up puffa vest. This style was a great hit last winter. This style, being sleeveless..
Eve's Sister Andy Top is skinny rib in white navy and gold stripe. Perfect with the Angie Pinafore94% Viscose 4% Elatane 2% lurexNB ..
Corduroy. Loving having this versatile fabric back. Shown here with the Andy Top100% cottonThree pockets / 2 side pockets and patch pocket..
White Eve's Sister tee with golden honey sleeves. Front print featuring sequinned boho bear. The sleeves have a self coloured flock spot.1..
Are you looking for an easy comfy dress that will go anywhere and is not too grown up for your sweet lass? The Eve's Sister Daisy Dress is avail..
Eve's Sister tee with dreamy print embellished with gold sequins. Gold feathers on the sleeves make this a very appealing option.100% Cotton.. Such a pretty print on this Eve's Sister tee. There is even a little sparkle. Soft and comfy 100% cotton knit. This range is super popular w..
"Glitter is my favourite colour." This Eve's Sister Elsie Tee has such a pretty print on the front. The floral back has a scooped hem..
Eve's Sister Emily Long Sleeve Tee has a pretty peplum. Soft English rose pink with rose gold dots.100% Cotton160gsm slub jersey..
"Let's Be Gypsies" in glittery gold. Eve's Sister Gypsy Dream Tee is blush pink with a white stripe.Main 100% cotton 160gm slub jersey..
Easy wearing comfy style. Two layers with frayed hem on a shirred elastic waistband.Sizes 3-7 yChambray Blue100% Lyocell (Tencel)..
Eve's Sister Hazel Dress in blue and navy stripe. This has been a popular style for summer. The image does not do it justice.CollarSleevel..
Loving this tee. The charcoal print on white cotton is embellished with fluro pink and apricot with silver detail as well. The back has an..
Eve's Sister Maggie Legging with navy glitter spot for girls 8-16These are a nice winter weight95% cotton 5% elastinAvailable in sizes 8 to 16..
Soft and snuggly navy velour Eve's Sister Olivia Leggings. The velour is so beautiful it almost glows95% polyester 5% elastinAvailable in sizes ..
Softest soft blue Eve's Sister racer shorts have a turned up cuff and multi-coloured twisted cord tie.Sizes 3-7 y100% cottonelastic waist..
Eve's Sister grey marle Scribble Crew is a bit of fun with flock squiggles and doodles.240 gsm80% Cotton 20% Polyester french terryAvailable in sizes ..
Navy hoodie with silver shooting stars and holographic sequins. This hoodie is brushed fleece and feels lovely and cosy.300gsm brushed fleece65%..
Eve's Sister Sweet Playsuit in neon coral and white print. I just love the back on this. See the second image for the detail.Sizes 3-7 y..
White with sequin and feathers. "Your Vibe Attracts you Tribe" The bobbled frill runs front to back over the shoulder100% Cotton..
Eve's Sister Weekend Denim jegging in ink. The fabric is a good weight and stretch. They look and feel great on. 95% cotton 5% elastin ..
Eve's Sister Wildflower TankSizes 3-7 y.. Pretty in lilac with frilled peplum and navy bobbles hem. Longsleeves Eve's Sister Shine Bright Tee with silver glittery spots.100% Cotton.. 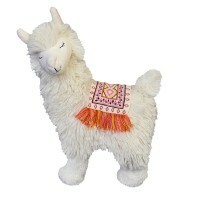 Such a sweet expression on the face of this Llama makes it quite irresistible. Soft and snuggly comforter to match. very sweet40cm .. Mid grey and cream stripes for this funky zebra. Cotton knit with polyester filling. 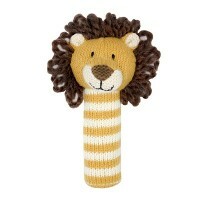 Matching comforter and rattle available.Height 15cm&n..
Arthur the Lion knitted squeaky rattle. 100% cotton knit. Matching comforter and rattle available.Height 15cm fill - polyester .. 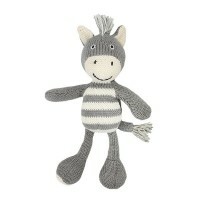 Mid grey and cream stripes for this funky zebra. Cotton knit with polyester filling. 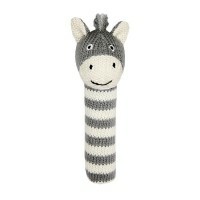 Matching comforter and stick rattle available.Height ..